They long worried about Charles Scontras’ behavior and weren’t surprised by Saturday’s confrontation. 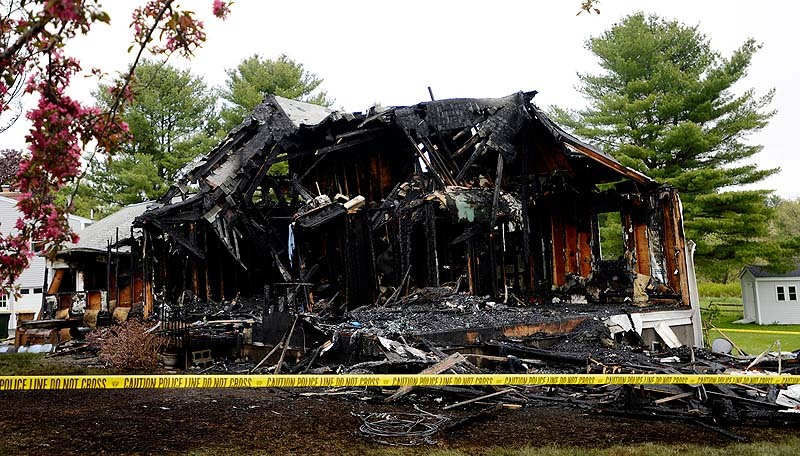 SACO — Friends and family members of the Saco man who police say barricaded himself inside his house and then died in a fire that he set Saturday described him as a troubled man whose problems erupted during the past week. The remains of Charles Scontras, 58, were removed from the burned-out shell of his two-story home at 16 Hillview Ave. late Saturday after a 4-hour standoff that neighbors said they saw coming for some time. “I can’t say this was shocking, but it was upsetting,” said Janice Gravelle, who lives across the street from the Scontras home in the tight-knit Hillview Heights neighborhood of well-kept homes and carefully tended lawns on the west side of town. On Sunday, a steady stream of curiosity seekers drove by the charred remains of the house, where a flock of robins pecked among the ashes. Groups of neighbors gathered in driveways to talk about the shocking developments at a home they said had not been a happy place for some time. “You could see it escalating,” Gravelle said. The standoff began about 2 p.m. Saturday when Scontras’ estranged wife, Diane, was escorted to the house by a Saco police officer at her request to retrieve some belongings. Neighbors said Scontras had ordered his wife to leave the house the week before and boarded it up. They said police visited the house at least once around that time. “He said he was prepared to defend his home,” said Harold Ouellette, who lives next door. On Saturday, the police officer saw smoke coming from the house and sent Diane Scontras to a neighbor. Ouellette said he saw Scontras, who had several firearms, then break a second-floor window and fire a shot. Ouellette said at that point police evacuated him and his wife, Joyce, to a neighbor’s house, where they watched the standoff unfold. The Maine State Police tactical team was called in and more than a dozen troopers surrounded the house. Police had intermittent contact with Scontras by cellphone but he refused to come out. About 6 p.m., smoke was again spotted coming from the house, then started billowing out. The flames were so intense they melted the siding on Ouellette’s house and damaged the cars parked in the driveway. By 8 p.m., the Scontras house was in ruins but fire investigators had to wait for the ashes to cool to look for the body. On Sunday morning, Scontras’ estranged niece, Carol-Ann Scontras of Saco, sat on a corner of the Ouellettes’ lawn looking at the house and quietly weeping. She said she was crying tears of anger for her grandmother, who had lived in the home until about a year ago, but not for her uncle, who moved into the house with his wife about 10 years ago. “I don’t want people to cry for this guy. There is no reason to,” Carol-Ann Scontras said. She said her uncle had long-term mental health issues. Ouellette, who described his relationship with Scontras as cordial, said his neighbor complained of terrible migraines that incapacitated him and for which he took medication. Charles Scontras was one of three sons, part of a four-generation Greek-American family well-known in Saco. His niece said the rest of the family was estranged from her uncle and his family and had taken out a restraining order against him to protect themselves from his abusive behavior. “He was so menacing. He was famous for sending long, abusive, disgusting letters,” she said. Carol-Ann Scontras said her uncle would call the employers of family members and slander them. He refused family members any contact with his frail mother, she said. She said in the past year the family managed to remove her grandmother from the house and she now lives at a Kennebunk nursing home. “I don’t know how she will take this,” she said. Carol-Ann Scontras’ father, Peter, is a retired longtime Saco Middle School teacher who now owns the Way Way Store, a well-known candy store and historic landmark on Route 112. Another brother, Ted Scontras of Saco, is a bank executive. Carol-Ann Scontras said Charles Scontras and his wife had two grown sons, both living out of state. 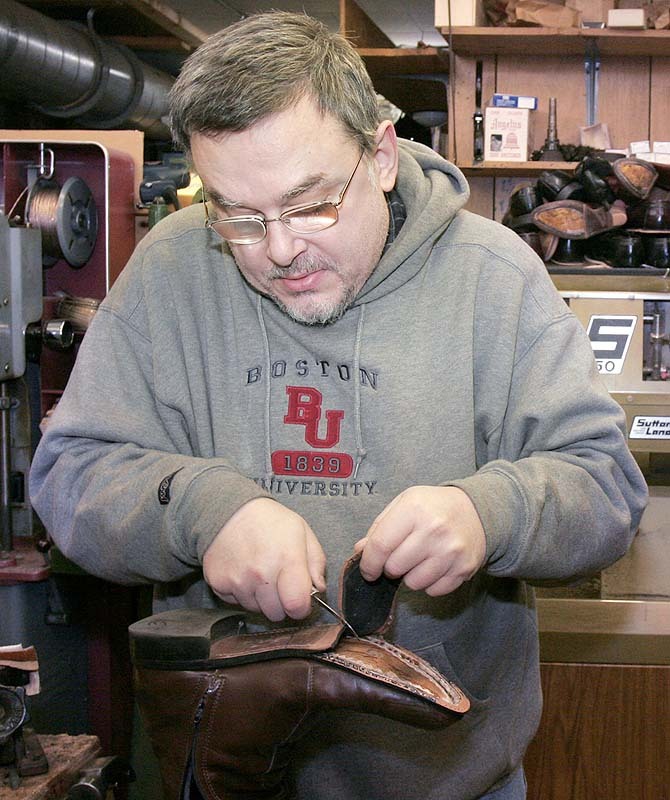 Charles Scontras was a real estate agent who bought back his grandfather’s shoe repair business, the Saco Shoe and Leather Hospital. He operated the shop for several years at 202 Main St., then closed it a few years ago. In a 2006 interview with the Portland Press Herald, Scontras said his grandfather, Papou Scontras, opened the business in 1919. An autopsy is being performed on Scontras’ body by the state Medical Examiner’s Office to determine the cause of death, McCausland said. Saco police released no new information about the incident Sunday. Watching the stream of cars driving through the usually quiet neighborhood Sunday morning, Carol-Ann Scontras said she wanted the burned-out house to be torn down. “Hopefully they will get rid of this tourist attraction soon so we can get on with our lives,” she said.